This Chicago-based alternative jazz trio led by bassist Joe Policastro features guitarist Dave Miller and drummer MikelAvery. While firmly rooted in jazz, the band’s open-minded, inclusive nature also brings rock, pop, old-school funk, soul, Brazilian, and free improvisation to the surface while still keeping the aesthetic of an acoustic trio intact. Held by Downbeat for its “deft analysis of choice repertoire,” and by the Chicago Reader for its “diversity of approaches to all kinds of source material,” the JOE POLICASTRO TRIO returns to Kerrytown Concert House celebrating the release of their fourth album, Nothing Here Belongs. 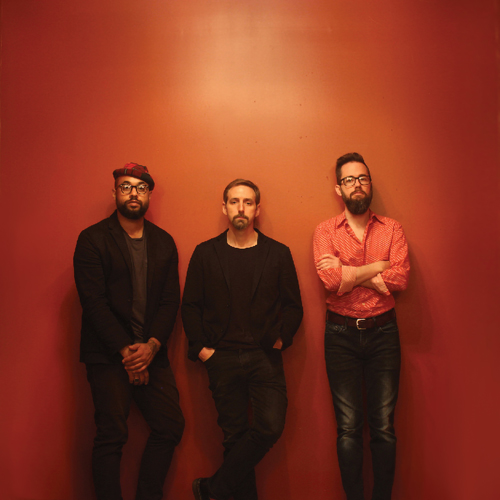 This Chicago-based alternative jazz trio led by bassist Joe Policastro features guitarist Dave Miller and drummer Mikel Avery. While firmly rooted in jazz, the band’s open-minded, inclusive nature draws upon a wide array of musical styles and sources while still keeping the aesthetic of an acoustic trio intact. Nothing Here Belongs marks the fourth release by the band. The new release follows in the wake of West Side Story Suite (2013), Screen Sounds (2017), all of which highlighted the trio’s ability to remake unlikely songs in its own raw, highly idiosyncratic fashion. Nothing Here Belongs, by contrast, for the first time showcases the trio’s captivating body of original music, while also including characteristically bold arrangements of songs by Bruce Springsteen, Talking Heads, and Santo & Johnny. True bands are a rarity in jazz these days, especially ones who hone their craft as consistently as this one does. Beyond Chicago, the band has been extensively playing together throughout the US and Canada having even performed for President Barack Obama.